I thought I'd do something a bit different and talk about an exhibit here in D.C. that I recently went to visit. I've lived in the city almost a decade now, and I've been to the Smithsonian Museums multiple times, and several other places around town (The Newseum, the Museum of Crime and Punishment, and so on). But I had yet to visit the National Geographic Museum, partially because there's an entry fee for their exhibits and with so many free Smithsonian museums around, you really have to have a good reason to spend money to get in the door of a place here. But earlier this month I found out that they were going to be hosting an exhibit called Indiana Jones and the Adventure of Archaeology, which I'd actually heard of a while back and wanted to see it so I was glad it was coming here to D.C. That made it easy to buy the tickets, though I'll get into the price point in a few minutes. Going into the Indiana Jones exhibit, I knew that there were some video portions because a professor from my grad school helped create them. But when the guy at the desk asked if we wanted the "video walkthrough" I had no idea what he meant. I've seen museums offer audio tour supplements for an extra fee, but this actually not only comes with the price of the exhibit but it's an integral part of the experience. It becomes clear very quickly when you start out how this exhibit is very different from what I'm used to. The little video tablet walks you through how to use it (that's what video is playing in the picture) and basically instead of lengthy signage all over the items on display, there's a short description and a number. 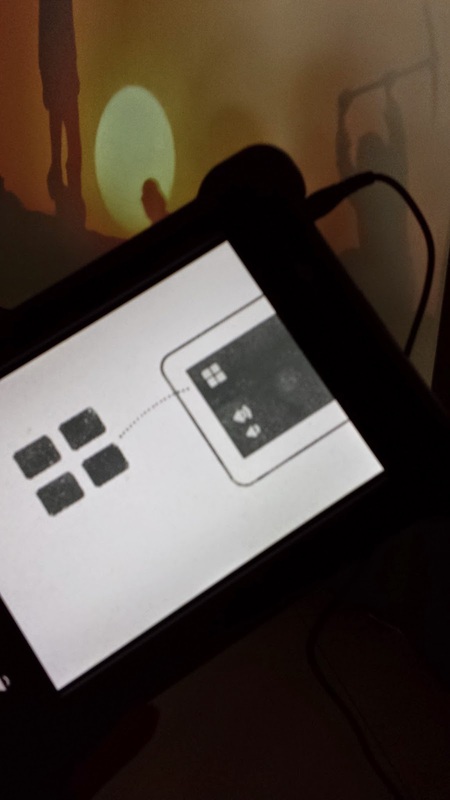 You type in the number onto the tablet, and it starts either an audio description or a supplementary video. This means that unlike a lot of other exhibits where there's a ton of overlapping sound and some things get very hard to hear, you're listening to your own headphones and watching the videos at your own pace. There's not as much sitting through the second half of the video then seeing the beginning as it loops back around. I have two very distinct opinions about this. The first is that it was amazing, and really innovative. I actually know a slight bit more than the average person about exhibit design, since members of my family have worked at art museums, and I thought this was just ingenious. What a great way to bring in multimedia without being too overwhelming with it, and let each museum patron move at their own pace. Not to mention how easy it makes it for you to tailor the experience to your own desires. And I imagine that eventually they could use this for metrics data to see which videos are the most popular, and which parts of the exhibit people weren't paying as much attention to. The only major problem this brought into the situation though is that it made everything take MUCH longer. I can skim/read a descriptive plaque in a few seconds, but when the audio is being read by someone I have to take the full 90 seconds that they're devoting to it and go at their pace and not mine. In a few parts of the exhibit, that started to really bother me, especially because I'm not the most healthy person and there just simply weren't enough benches and places to sit throughout the space. If you're going to make it take almost a full two minutes at every single item, then people need to sit down more often. Not because they are lazy, but because you need to think about your patrons who are disabled but aren't in wheelchairs. The other issue was that the video/audio created bottlenecks at certain points. The start of the exhibit was actually kind of difficult to get through because we happened to walk in at the same time as several other people and we were all watching the same videos at first. It wasn't until I decided to skip a description that that pack of people finally was offset enough that we weren't bumping into each other. Basically in the end, I didn't listen to many of the audio parts because they were all pretty lengthy and I was getting tired, but I did watch all of the videos (except for one I apparently missed because my mom mentioned it and I hadn't seen that one, still no idea how I didn't see it). The videos were great because they included behind the scenes footage, animations, and really fascinating extra knowledge. And I'm sure the audio had all kinds of extra info too, but I don't even really like listening to audio books so it just wasn't catching my attention. The videos held me more, and that could just be me (I am a filmmaker after all). 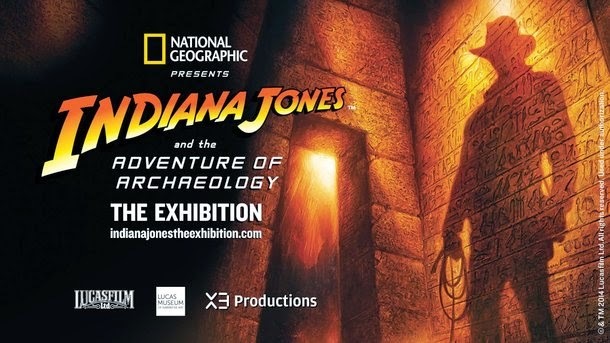 The exhibit was done in release order for the films, moving from Raiders of the Lost Ark to Temple of Doom, then Last Crusade and Crystal Skull. Each film was followed by a section on the science of archaeology that explained how something that Dr. Jones did in the film is also done in the field, while also debunking a few things that a real archaeologist wouldn't do. My favorite connection was after the display about Last Crusade, the exhibit had artifacts and real life examples of scientists using the context of the artifact to "decode" it's meaning and use, like how Indy "decodes" the grail to determine which is the correct one. Each film was represented by a few costumes, some of the prop artifacts, concept art, marketing materials, and a few looping video clips (some of the only looping video in the exhibit, it was silent unless you typed in the number on your tablet, and it would then play the looped sound synced up to what was airing at the moment. It was a neat feat of technology). The costumes were fantastic, and the choice of which props and concept art was perfectly curated. 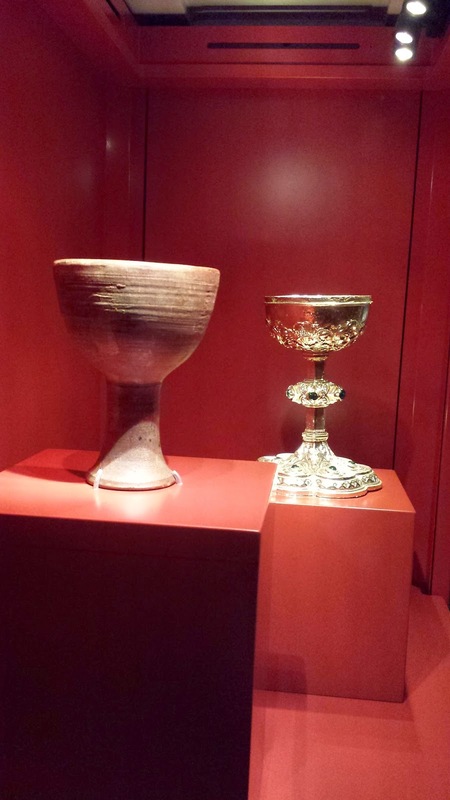 The "artifacts" they had on display were exactly the ones I wanted to see, from the Ark of the Covenant to the Sankara Stones to the Cross of Coronado. 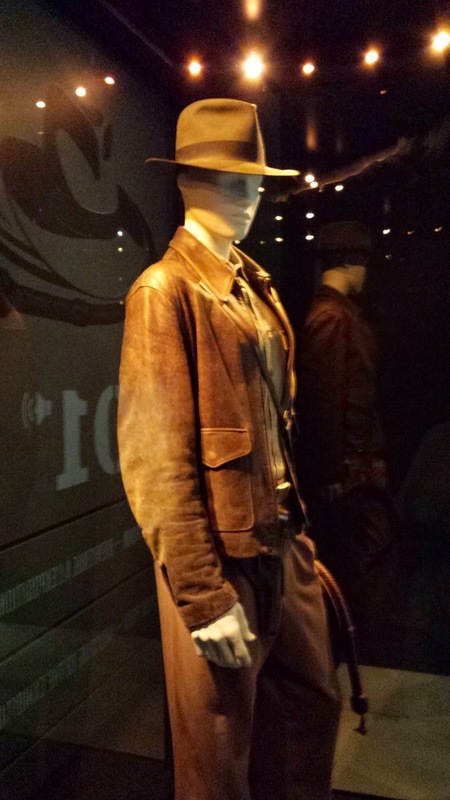 And yeah, okay, there was some cool stuff from The Crystal Skull in there too. The videos had a lot of making of stuff, and information that even as a big fan of Spielberg's films, I had never heard before. It was well worth the visit, and just the Indiana Jones exhibit would have been worth the ticket price for sure. 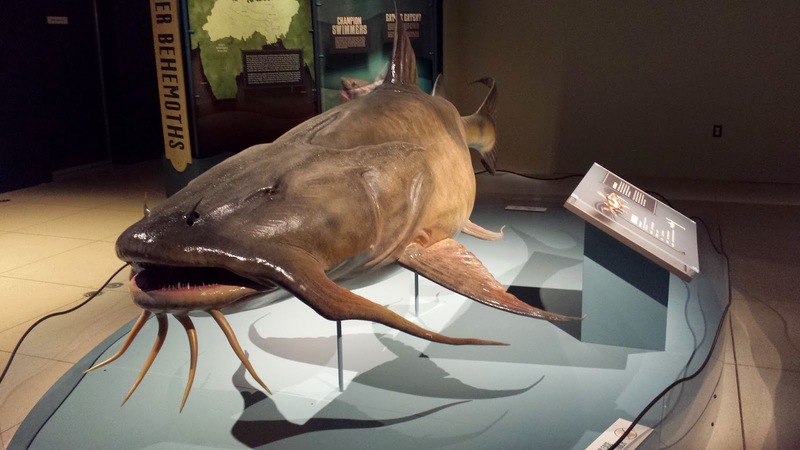 There's also a lot of great branded merchandise in the shop, and for the price of admission you get to see their other current exhibit, Monsterfish. 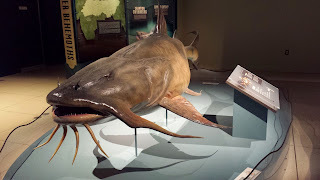 We didn't spend as much time at Monsterfish because we were pretty exhausted from the wonderful but time consuming exhibit, but it was also really well done. There were a lot of interactive elements that I think kids would enjoy, and a great opening video. I know I went on about looping videos, but they're not bad when sparingly used and this exhibit did them right. The only thing that gives me pause about the whole thing is that we paid $15 for the entry fee, and while I have no problems paying that for the Indiana Jones exhibit, and I highly recommend it, until this week that entry fee only included Monsterfish, which was cool but not worth that much (I think the fee was only $11 at that point, but still too much). When this set of exhibits closes, will the entry fee still be worth it? I really don't know. It seems to me like it could be really hit or miss on the value, so maybe I'll keep an eye out for exhibit reviews before I go back there for anything new. And if that's what you're doing then I'll just say again that the Indiana Jones exhibit is absolutely worth the price of admission, you should go.